When was the last time you told yourself something that you liked about yourself? When was the last time you told yourself you weren’t good “enough” at something? Or maybe that your efforts or small steps didn’t count? My hunch is that you probably tell yourself all sorts of “not enough” stories each day, but infrequently focus on what you like (how about LOVE) about yourself. But I have noticed what seems like a chorus of “not enough” thoughts from friends, from clients, on social media and in conversations. And in myself, more and more. The funny thing about this is that I’ve been down this road before. I was inspired in 2011, when I was blogging – to spearhead a movement to Just.Be.Enough. Because it felt like the “not enough” energy was spreading at warp speed. I’ve done my work to catch my thoughts, to notice when I am telling myself stories and practice acceptance. But guess what? The thoughts still creep up. Even to me. So I decided to bring back a focus on the things we like about ourselves. Because it is time. To celebrate who we are right NOW. Today. To claim our space for all that is fabulous inside us. Liking yourself doesn’t mean there isn’t work to be done. It means that you are able to show yourself compassion. Give yourself gratitude for what is abundant and good. Imagine how your day would be different if you focused on being your own best friend instead of your own worst enemy? So today is the day. 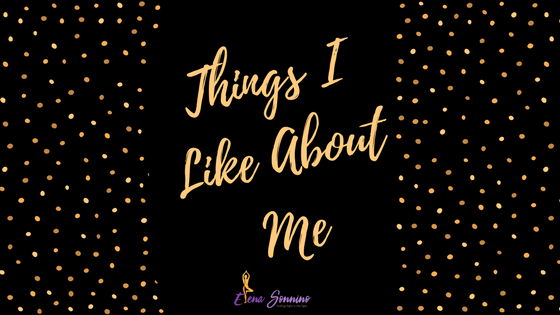 To coincide with the new moon and dark night sky, I am shining my own light on all the things I like about me. And invite you to do the same. I like my contrasty blond highlighted hair. It is bold and radiant. Like me. I like my calming voice. I like my breath. It is powerful and calm all at the same time. I like my voice when I sing out loud. It may not be ready for the public, but it makes me happy to sing my favorite songs. I like that I tune into my intuition as a compass. I used to be a “do everything early” kind of girl and I recently noticed that I tend to be doing things more at the last (or almost last) minute and instead of judging myself, I notice that this allows me to feel not overthink. I like that I am able to laugh at myself, even when (and especially when) I am falling. I like how comfortable and confident I am when speaking in front of a group. I like my legs. They are strong and muscular. I like my hugs. I give good hugs. I like my c-section scar on my belly and the small dot radiation tattooed on my chest and chin that remind me of what my body overcame in the past. I like my ability to tune into my heartbeat and just listen. I like that I still wobble while balancing on my yoga mat. It reminds me that rooting down is a daily choice that I make. I like my breath. Oops, I already said that. I guess I really do like it. It keeps me grounded in one moment at a time especially on hectic days instead of letting the frazzle get to me. I like that I have big ideas and let myself run with them. I like my collarbones. Random, I know. But I do. I like that I am persuasive and persistent when I truly believe in something. I like that I have learned to pick my battles and let go of energy that doesn’t serve me (and that I catch myself when I fall back into old ways). I like my comfort level with travel and adventure. I like getting lost and knowing that exploration is part of the journey. I like my authenticity. I am the same person, wherever you meet me. Are you ready to embrace the shine and focus on things you like about yourself? Are you ready to Just.Be.Enough? Are you ready to Just.Be.Enough? Write your own list Things I Like About Me. Don’t worry about how many you come up with, just start writing. The trick with these is to focus on things you like about YOURSELF. Not the things you do. Not the things you have. If you like something that you do, ask yourself – what is it about you that allows you to do that thing? And then go read the posts of others. Not only will you be celebrating your own shine, but you'll lift up everyone else by cheering each other on. I cannot wait to celebrate with you!